As is told in the Codex of Aihrde, the gnome Olaf Tryggvason came to the halls of the Troll Lord Rodzek, he who ruled from the Elephant’s Back, and demanded justice for wrongs done to his family in bygone days. Rodzek choked on his own laughter when Olaf broke his foot and knee and proceeded to pulverize him, such that they found the shattered remnants of Rodzek’s bones in his stool. In payment Olaf took the knuckles from the Troll’s hands and returned to the kingdoms of man and dwarf. Not long after, Olaf hit hard times and sold seven of the knuckles to a blind witch, passing them off as the teeth she longed to have. The last three he kept, as it occurred to him that they would make nice dice. He carved various numbers on them and proceeded to gamble his way into prison where he passed on the last of the Troll Knuckles to one of the guards who in turn took it to the palace and the rest is history; Troll Knuckles was born! The only peculiar habit of knucks, those purists addicted to the game, is that they must use true “Troll Knuckles.” And as these frequently regenerate, the players are forced to carry small knives called Olaf’s Teeth, to par them back down. 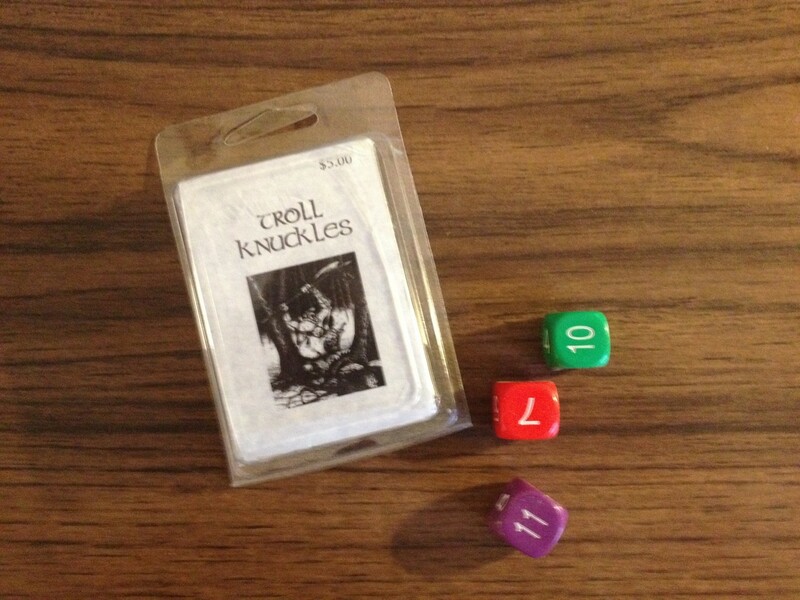 Troll Knuckles is a simple dice game played with three seperate dice to achieve various hands or "guts." Based on odds and evens and troll primes. You can't go wrong here!